The Crested Butte Mountain Resort has long been known for its diverse terrain that appeals to skiers of all kinds but also its steep, backcountry terrain and its pioneering support for extreme skiing, which earned it recognition as the birthplace of freeskiing. The ski area covers 1,167 acres, with a base at 9,375 feet and a summit at 12,162 feet. Its vertical drop, however, is 3,062 feet from a peak reached by a short hike down to a lower lift below the village that sits at the base of Crested Butte Mountain. Crested Butte has 121 trails and rates 20 percent as advanced, 57 percent as intermediate, and 23 percent as beginner. There are 16 lifts, with a capacity of 20,310 riders an hour. Experts will enjoy the steep Peel or Banana trails off the Silver Queen lift, while intermediates will find abundant trails off the Gold Link and Prospect lifts or more challenge from the steep Twister and Crystal runs. Beginners can start on trails from the Red Lady Express lift or move up to the trails off the Painter Boy lift. The area features 526 acres of in-bounds, double-black-diamond terrain in the Teocalli Bowl that draws experts with rocky chutes, cliffs up to 40 feet high, and pitches averaging 39 to 44 degrees. The area, known as Extreme Limits, boasts some of the toughest terrain in North America. Mountain guides are available for hire and are recommended to navigate dangerous bands of cliffs as well as laws barring out-of-bounds skiing. 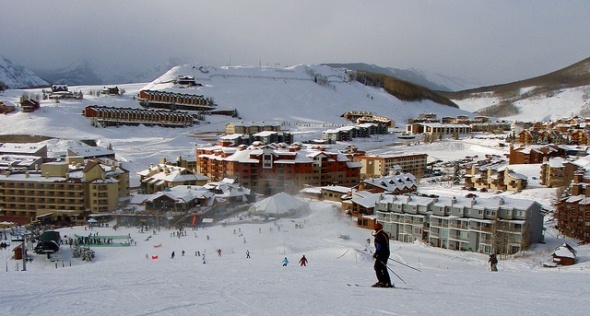 Crested Butte averages 300 inches of snow, with a ski season that begins at Thanksgiving and runs into early April. It has snowmaking capability on 282 acres. There are three terrain parks. Beginner Park is open to skiers, snowboarders, and snowskates and offers rails, tabletops, rolls, and a mini-halfpipe. Intermediate Park offers a variety of rail features. The 2,600-foot Advanced Park has advanced jumps and a dozen rail features. There also is the DC Superpipe, which is 55 feet wide and 18 feet high, with a slope of 17 degrees, and a Snowboard Skiercross Track. The ski area has four on-mountain restaurants, including the Rustica Ristorante, the Paradise Warming House and the newly remodeled Uley’s Cabin. The resort is in the middle of a $200 million upgrade, including the addition of a guided zipline tour with five lines and three suspended bridges that is a first for Colorado, and upgrades and expansions across the resort. Crested Butte is home to Colorado’s first X-Games, the U.S. Extreme Freeskiing Championships, and the U. S. Extreme Freeskiing Telemark Championships. The ski area wants to expand onto nearby Snodgrass Mountain to open up 276 acres of intermediate and advanced terrain, with three lifts, an 800-home village and a pair of gondolas. The proposal was rejected by the U.S. Forest Service and may be headed into federal court.